Clouds and mountains together are so majestic! Yes, it must be soul-nourishing to live in the mountains year round. Brenda, fine poem and great shot. Is the the Green Mts. of Vermont? 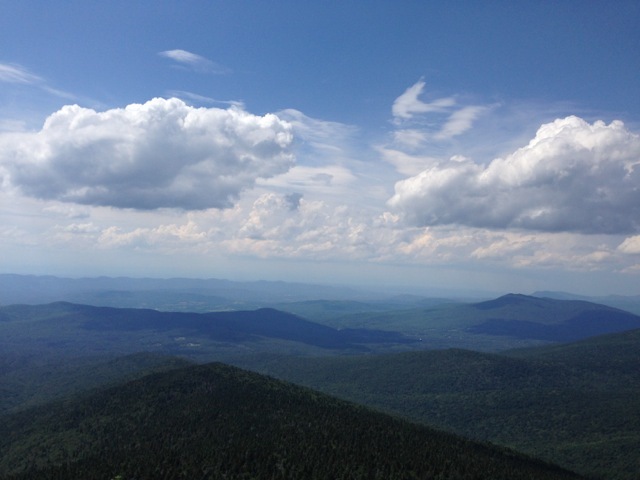 Yes, that was from the top of Killington on a hot, lovely day. I assume those are the Green Mountains. They are beautiful, aren’t they? The air is sweeter there. Isn’t it? And I almost missed it. This is pure magic, from the photo to the imagery your words create. I cannot remember enjoying anything more. My heart is all aflutter from your words. You are a lovely pachyderm, my fine friend. You are too kind, my lovely lady. love the picture and very lovely poetry! Thanks! 🙂 It was a beautiful place. I love the blue dragon and your poem and photo are so enchanting! Thanks, Cheryl-Lynn! I hope you’re having a great week! A cold on your vacation, though. Bummer!